This week’s post introduces the work of Norwegian composer Eivind Buene, who will be a faculty composer at this year’s June in Buffalo festival. For nearly two decades he has been active on the European new music festival scene, with commissions from Ensemble Intercontemporain, Birmingham Contemporary Music Group, and Fondation Royaumont, and performances at the Berlin Philharmonie, Centre Pompidou, and Carnegie Hall. The scope of his artistic activities is unusually broad, with frequent collaborations with improvising musicians, and, since 2010, the publication of multiple novels and collections of essays. He is currently on faculty at the Norwegian Academy of Music. This year’s June in Buffalo will feature live performances of four works from Buene’s Possible Cities/Essential Landscapes cycle (2005-2009): Grid, Landscape with Ruins, Ultrabucolic Studies, and Nature Morte. The cycle as a whole consists of nine pieces for varying chamber ensembles that explore processes of growth and decay, as well as hybrids of cyclic and organic form, inspired by Italo Calvino's book Invisible Cities. A recording of the complete cycle, performed by the Cikada Ensemble—also a guest at this year’s June in Buffalo—is available on Youtube and Spotify. The cycle is built from elemental, pliable building blocks, for instance, as Grid begins with three such building blocks: glissandi, double-stop sequences, and sustained tones. In this case, the elements are characterized most strongly in the domain of pitch; elsewhere in the piece, their identities have more to do with their physical process of production, for instance in the sustained “scratch tone” (performed with unusually high bow pressure) that enters later in the piece. These elements are subject to wide ranging transformations, and indeed this is where the music’s interest lies. Sequences of elements sculpt kinetic energies in a compelling drama, one that does not overtly reference earlier formal models but engages in a dialogue with earlier tonal music’s preoccupation with accumulation and dissipation of momentum. In less skilled hands, the music’s (perhaps deliberately) anonymous materials might come across as lifeless and academic, but Buene’s successful use of sectionalized, often proportionally imbalanced forms together with inventive ensemble textures lends the materials a striking character, depth, and energy. Landscape with Ruins for piano trio is a striking example of Buene’s capacity for textural invention. The piano and the string instruments (violin and cello) seem to inhabit different worlds, and yet seem to coexist in an inexplicable way. For much of the first half of the piece, the piano’s material is chordal and measured, referencing tonal sonorities and occasionally barely disguised tonal chord progressions (the influence of former UB professor Morton Feldman is evident), while the string instruments’ material is floridly melodic and restless. While the two layers frequently follow independent phrase structures, they occasionally converge on common points of motion and repose. The layers struggle to communicate with each other but depend on each other in some vital way, something that is made manifest as the piano and strings effectively switch material identities towards the piece’s end. Perhaps the “landscape” of the title refers to this multiplicity of perspective; traditionally, the landscape is the opposite of the portrait, offering expanse and multiplicity in place of the portrait’s closed, singular perspective. In Buene's work, polyphony refuses containment within the interiority of tonal models of counterpoint. Landscape with Ruins: disintegrating traces of human(ist) culture—traces of historical tonality, with their connotations of the “civilized” European Enlightenment—are embedded in a scene that exceeds tonal countepoint and its reductionist modes of listening. This profile of Ensemble Dal Niente kicks off a series of profiles introducing composers and ensembles featured at this year’s June in Buffalo festival. Founded in 2004 by students at Northwestern University, the ensemble's professional profile has risen at a noteworthy pace. The group’s acclaimed performances at the Darmstadt Summer Courses for New Music were a crucial break, as the ensemble took top prizes (2010 & 2012) and then returned as invited guests (2014). This recognition led to invitations to perform at concert series and festivals such as Concerts from the Library of Congress, Ecstatic Music Festival, Festival International Chihuahua, Latino Music Festival, Music Arte Panama, Ravinia Festival, and SALT Festival, to conduct workshops at universities such as Northwestern, Chicago, Harvard, Stanford, Indiana, Illinois, and Western Michigan, and to record on labels such as New Amsterdam, New Focus, Navona, Parlour Tapes+, and Carrier labels. The group has developed a range of innovative approaches to concert curation. Perhaps most striking is Dal Niente’s annual “THE PARTY,” a marathon concert in “a non-traditional performance space, a flexible floor plan,” where music is “paired with food and beverages,” in “a relaxed environment where audiences can mingle and move around, and musical performances that run the gamut from the hilarious to the sublime.” “Hard Music, Hard Liquor” concerts are another Dal Niente fixture, featuring group’s phenomenal players in adventurous ultra-virtuosic solo and chamber works, which are often innovative new works by emerging composers. The group also ventures outside the bounds of new concert music, for instance in their genre-bending collaboration with the rock group Deerhoof and composer Marcos Balter, resulting in a critically-acclaimed 2016 album on New Amsterdam records. Dal Niente’s story is different from that of many other new music groups in light of its origins in a Midwestern city. The group has not only succeed despite the obstacles inherent in this trajectory (such as limited access to well-funded new music presenters and to important professional networks, etc. ), but has also helped put the wider Chicago new music scene on the map, together with groups like the International Contemporary Ensemble, Eighth Blackbird, and recent Grammy award winners Third Coast Percussion. Today, the city is a destination in its own right for new music activity (probably more so than any other non-coastal US city), with significant new ensembles (a.pe.ri.od.ic, mocrep, Fonema Consort), festivals (Frequency, Ear Taxi), record labels (Parlour Tapes+) and publications (Cacophony Magazine) emerging regularly across the city. As more attention is paid to new music scenes in mid-sized and middle-American cities, the work of Dal Niente and others in Chicago appear in retrospect to have played a pioneering role in new models of arts programming. Dal Niente's name, meaning "from nothing" in Italian (taken from the title of an important work by Helmut Lachenmann), alludes to these humble beginnings. Dal Niente has forged a range of connections with the Center for 21st Century Music over the years. The ensemble was an invited guest at last year’s June in Buffalo, where their performances were well received. However, the group’s relationship with the Center goes back much further in its work with UB doctoral composition students, particularly alumnae/alumni Megan Beugger, Aaron Cassidy, and Evan Johnson, and current PhD candidate Colin Tucker. In 2012, Johnson received a Meet the Composer Commissioning Music/USA grant for a new work for the group, which was premiered on a high-profile concert at the Darmstadt Summer Courses for New Music in Germany; the piece was awarded a prestigious Stipendpreis. Both Tucker and Beugger wrote solo works for the group’s violinist, Austin Wulliman, and all four UB composers have been regularly programmed by the group. At UB we look forward to Dal Niente’s return this June. In the meantime, you can check out their website, audio clips from the group’s commercially available recordings, videos, photos, and the group’s blog. PhD composition students at the Center for 21st Century Music had a busy year in 2016, with high profile festival appearances, portrait concerts, and a prominent role in a new book surveying the recent history of experimental music, among other successes. In 2016, UB PhD composers’ work was featured at leading festivals and venues throughout North America and Europe. Weijun Chen received the Jacob Druckman Prize, resulting in the commission of a new work, Dancer (orchestral version), premiered last summer by the Aspen Philharmonic at the Aspen Music Festival in Colorado. Chen's music also made an appearance at New York City’s MATA Festival, where Dancer (chamber version) was performed by Ensemble Linea. Matt Sargent, now Visiting Assistant Professor of Electronic Music and Sound at Bard College, composed Three Illuminations for Ensemble Mise-En during a residency at I-Park International. The work was premiered at NYC’s National Opera Center and was later selected for the prestigious 2017 ISCM World Music Days; other pieces by Sargent were presented at the New York City Electroacoustic Music Festival, Chicago’s Frequency Festival, and Germany’s Darmstadt Ferienkurse für Neue Musik. On a more local note, this year’s June in Buffalo festival featured works by four UB doctoral composers Weijun Chen, Brien Henderson, Igor Coelho Arantes Santana Marques, and Colin Tucker, performed by Ensembles Uusinta and Dal Niente. Two UB PhD composers were the recognized by portrait concerts devoted solely to their work, a rare honor for young composers. Colin Tucker’s maps of disintegration and forgetfulness, a series of works for small ensembles, was featured on a concert at Detroit’s Trinosophes, while Matt Sargent’s music was the sole focus of no less than three individual portrait concerts, presented by The Wulf, the Silpe Gallery of the University of Hartford (CT), and the Woodstock Artist Association and Museum. The former two events featured Sargent’s new work Tide for UB alumnus TJ Borden for solo cello and electronics. Other UB composers were active creating work in a wide range of mediums. 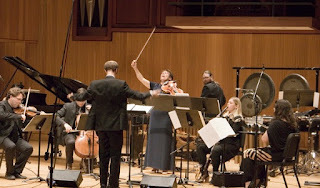 In the realm of chamber music, Derick Evans was commissioned along with Pulitzer Prize winner Caroline Shaw to write a new piece for the River Town Duo, while Roberto Azaretto’s Abrasion platforms was commissioned by Argentina’s Fundación MúsicaAntiquaNova for Thomas Skeweres and Yui Iwata. For Ensemble Linéa’s April visit to the Center for 21st Century Music, Roberto Azaretto, Matt Chamberlain, Weijun Chen, Meredith Gilna, Alex Huddleston, and Su Lee wrote new works for the group. UB doctoral composers have also been active writing for virtuoso soloists who specialize in new music: Colin Tucker’s center unmoored in the presence of infinite fringes was premiered by tuba soloist Aaron Hynds at Bowling Green State University, while Jessie Downs’s Torpid Smoke was premiered by percussion soloist Christian Smith at the Basel Music Academy. Downs, in addition to Meredith Gilna, also composed new works for UCSD doctoral flutist Michael Matsuno, who visited UB to premiere the works last March. Beyond chamber music, UB PhD composers took on ambitious large-scale projects, such as Matt Sargent’s trumpet concerto “The Singing Shore,” premiered at the River Concert Series in St. Mary's City, MD, by soloist Jeff Silberschlag and the Chesapeake Orchestra, and Colin Tucker’s voice-dross, a five-channel, two-room, long-term sound installation at Detroit’s Spread Art. In addition to recognition by performers, festivals, and venues, the music of UB composers featured prominently in the book Experimental Music since 1970 by Jennie Gottschalk, published by Bloomsbury this past summer. In surveying experimental music practices, the book discusses works by current PhD student Matt Sargent, PhD alumni G. Douglas Barrett, Megan Beugger, Aaron Cassidy, and Evan Johnson alongside those of master composers—such as Maryanne Amacher, Cornelius Cardew, Julius Eastman, and MaxNeuhaus—who were Creative Associates at UB during the 1960s and 70s. In addition to their compositional endeavors, UB composers were also active in performance and curation, initiating innovative musical programming locally, nationally, and internationally. Matt Chamberlain was active internationally as a conductor, conducting two works by Josh Levine with the Slee Sinfonietta at June in Buffalo as well as conducting his own work In Ignorance at the Budapest New Music Center as part of a master course with Peter Eötvös and friend of the Center Jean-Philippe Wurtz. UB’s doctoral composers were especially active in the field of vocal music. Jessie Downs founded Sotto Voce, a vocal ensemble focusing on works by emerging composers whose members include PhD composer alumni Ethan Hayden and Zane Merritt. During 2016, the ensemble presented two programs of demanding recent works by local, national, and international composers. Esin Gündüz, as a vocalist, was active as member of the free jazz ensemble resAUnance—whose debut album received praise internationally—and also joined a quartet led by free jazz legend Juini Booth. In the realm of concert music, she created a site-specific duo project “Senso di Voce” with oboist Megan Kyle at Buffalo’s Silo City, re-contextualizing Medieval, Renaissance and Baroque music through contemporary improvisation in the site’s reverberant acoustic. The event was featured in WNED public radio and other local press. Null Point, a curatorial initiative for new music in Buffalo led by Colin Tucker, also had an active year. During 2016 the initiative received competitive grants for its projects: New Music USA supported a recording project with Ithaca-based composer/percussionist Sarah Hennies at Silo City, while New York State Council on the Arts supported a series of workshops introducing youth in underserved neighborhoods to experimental music. PhD composers Jessie Downs, Esin Gündüz, and Colin Tucker, as well as alumni Ethan Hayden and Zane Merritt, were involved in developing and teaching the workshops. In the realm of performance, Null Point presented the North American premiere of James Saunders’s Surfaces as part of the Echo Art Fair. The piece—an open-ended series of prompts for sound making with unspecified surfaces—was brought into dialogue with Buffalo’s unique, historic built environment in a site-specific durational performance where all sounds were generated from the disintegrating floors of the vacant Buffalo Gear and Axle Plant.